Our best selling chain handcuff, the Smith & Wesson Model 100, are the standard that most law enforcement officers request. Feature smooth ratchets for swift cuffing, with double locks to prevent tampering. 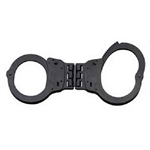 The cuffs, and locking mechanisms are both heat treated for reliability and strength. The Model 100s are fabricated from the finest quality carbon steel. Smooth ratchets enable swift cuffing in critical situations. Includes 2 handcuff keys and the Smith & Wesson lifetime guarantee. Inner perimeter range of 5 3/4" - 8"